← Ugly – and compassion. . .
As it’s got really cold in Bristol, I’ve crocheted her a selection of different hats, a scarf, 4 pairs of gloves, and some leg warmers – these are the things I actually completed in time to put into the parcel. I’ve now just finished a pair of mittens that convert easily into fingerless gloves, and I’m in the process of making her another pair of leg warmers – apparently, you can never have enough of these . . .
All of this has kept me particularly busy but, now the pressure is off, and I don’t meed to worry that she’ll feel the cold so much, I decided to get back to finishing off the blanket I’ve been making for myself, while also crocheting a crochet hook holder, which I desperately need, as I’ve got so many different hooks now. 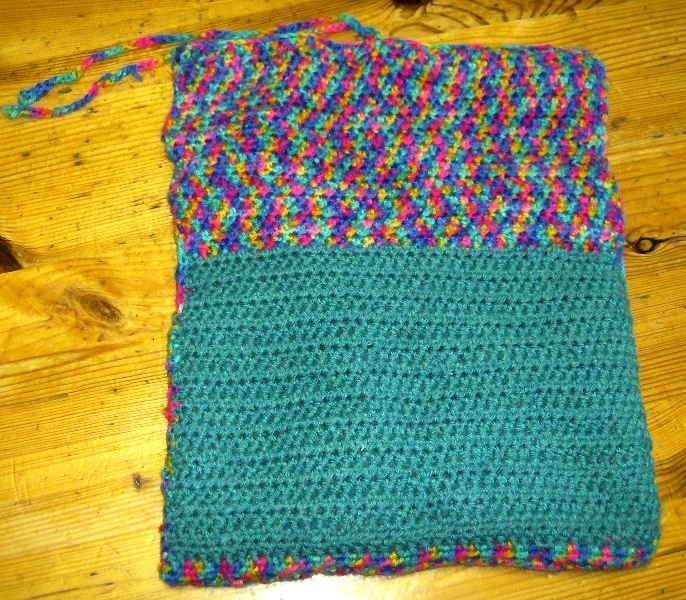 I used her basic pattern, but I converted it into more of a purse than a roll, as I wanted to keep all of my crochet stuff together in one package. 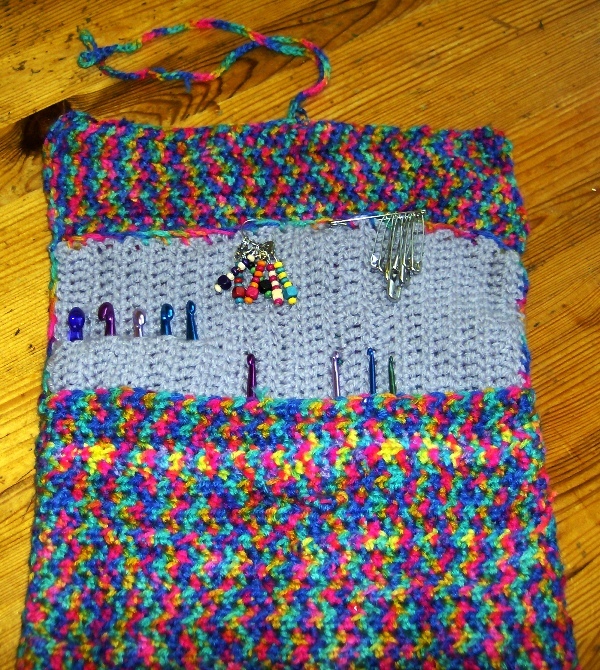 The crochet hook holder is in 2 layers – the outer layer all done in SC, with the inner layer done in a lovely dusky lilac acrylic wool, and crocheted in DC, so that the hooks can slide through the gaps and be held. I sewed the two layers together, then folded the resultant piece into 3, so it formed into a large clutch-type bag, which measures around 29 cms wide, and 22 cms high. 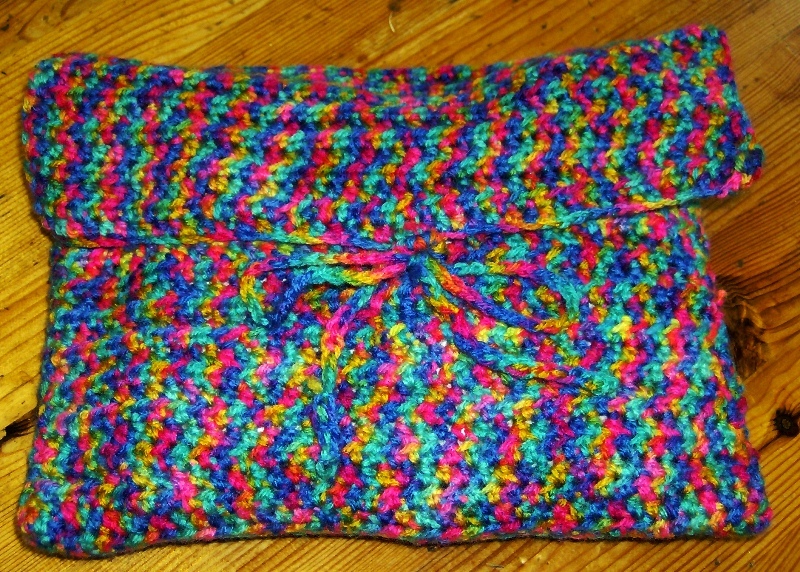 I then fastened it together with a chain made of the multi-coloured wool, sewn on to the front opening, and held closed with a loop sewn onto the bottom-front.